Many scholars of early Christianity argue that the early church was “drowning in a sea of Gospels” and that “Christianity’s early centuries were something of a free-for-all with regard to Gospel literature” (1). If there were a multitude of competing accounts of Jesus’ life and all Gospels are created equal, then the narrow selection of the canonical Gospels must have been a matter of coercion, with a particular faction of the church choosing which Gospels would belong in the church’s authoritative Bible. Accordingly, many agree that the selection of the Gospels was a late, controversial, and arbitrary development that was only achieved through the methodical suppression of rival voices. In this volume, Charles E. Hill seeks to present the historiographical minority report to this scholarly consensus. Through an investigation of the relevant historical data, Hill aims “to examine critically some of the foundational scholarship used to support and promote this now popular narrative of how the church ended up with four, and only four, Gospels” (4). Hill serves as a professor of New Testament at Reformed Theological Seminary in Orlando, Florida, and this volume draws on a substantive body of work dealing with the formation of the Gospels and early Christianity. The Quest to Find the "Chooser"
In his attempt to debunk the “conspiracy theory” of a late and coercively established Gospel corpus, Hill revisits the major figures in the debate and tells a different story about what they perceived and what they received. After a chapter on recent manuscript discoveries in Egypt, Hill begins with Irenaeus of Lyons in the late second century. In his writings, Irenaeus mentions each of the Gospels and provides a creative defense of why there are four of them. In order to render Irenaeus’ witness to a Gospel collection insignificant and “silence the Bishop,” some scholars portray Irenaeus as a lone ranger, almost totally isolated from the rest of his contemporaries. To counter this portrait of a “lonely Irenaeus,” Hill notes that Irenaeus wrote confidently “as if the church had been nurtured by these four Gospels from the time of the apostles” (41). In this sense, “he simply wrecks the popular paradigm,” because he seems to assume rather than establish this section of the New Testament (41). Hill next surveys a number of figures that followed Irenaeus (e.g., Tertullian, Origen) and shows from their writings that the acceptance of the four Gospels was relatively widespread. 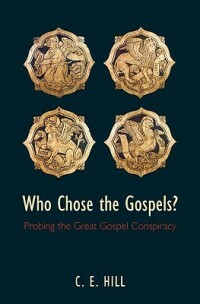 In the rest of the book, Hill digs deeper into church history in search of a figure capable of choosing the Gospels. Hill proceeds to implicate Clement of Alexandria, Serapion of Antioch, and the author of the Muratorian Fragment as “co-conspirators” along with Irenaeus in granting the four Gospels authoritative status. These figures “at points far distant from each another on the map, are all saying or implying that the church has the same four acknowledged Gospels” (99). The presence of Gospel harmonies (e.g., Tatian’s Diatessaron), works of synopsis, and liturgical pulpit editions also assume the existence and circulation of the Gospels in the late second century. These works are “all significant literary-technological ‘packaging’ projects which presuppose the primacy of the four” (121). Pushing back further, Hill engages the mid-second century teaching of Justin Martyr. In his apologetic work, Justin appeals to the “Memoirs of the Apostles,” which were written by “Jesus’ apostles and their followers” and were utilized in the worship of the churches (132). When Justin cites these memoirs, the content is drawn from Matthew, Mark, Luke, and John. Consequently, Hill concludes that “Justin knew all four canonical Gospels and knew them as an already standard grouping” (143). As was the case with Irenaeus, Hill argues that Justin was not necessarily out of step with his contemporaries in his view of the Gospels. Justin too had “co-conspirators” that indicate the public and widespread usage of this collection. A number of works among the Apostolic Fathers (e.g., Polycarp of Smyrna, Ignatius) also exhibit an awareness of “the gospel” not only as an oral proclamation but also as a written entity. Though these early precursors are by no means definitive, they do suggest that the “religious apparatus” that “made the reception of the four Gospels, as well as the rest of the New Testament, possible (if not inevitable), was in place already in the late first century” (204). In his last presentation of evidence, Hill entertains the possibility that there was an “arch-conspirator” in the first century who had a hand in choosing the Gospels. He suggests that an important, and perhaps the earliest, testimony to a four-Gospel collection is embedded in the writings of church historian Eusebius. In his work Ecclesiastical History, Eusebius records a selection of comments from Papias, bishop of Hierapolis in the early second century. 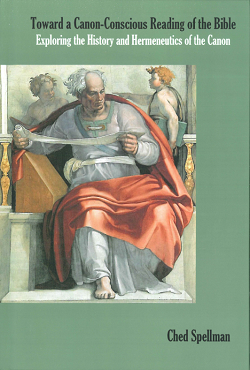 In these selections, Papias recounts the testimony of a figure named John the elder, who gives witness to all four Gospels and even asserts that the apostle John wrote his Gospel in order to complement and complete the Synoptics. Even if this account is “legendary,” the fact that Papias recounts it means that he was aware of the close relationship between the four Gospels. Papias, then, represents “the earliest first-hand source for a recognition of all four Gospels” (222). After this extensive survey, Hill returns in a concluding chapter to the book’s central concern. If his survey of evidence is plausible, then the question of who chose the Gospels at least pre-dates the fourth century. Each step taken back into the history of the church has a signpost pointing to an earlier generation. The evidence for an authoritative moment of selection by a “primal chooser” is “embarrassingly lacking” and “we simply know of no councils or synods from this period which deliberated on the matter” (230). Even the attempt to formulate possible criteria of canonicity that the church used misses the point, because “the church essentially did not believe it had a choice in the matter!” (231). According to Hill, the question would not have made sense to the churches of the second century, because these writings “had been in the family as long as anyone could remember” (233). In this context, the internal textual properties of the Gospels themselves are what commended them. These were the Gospels that presented Jesus as the Messiah of the Hebrew Scriptures and the ones in which the church “encountered the real Jesus and divine power” (239). The competing Gospels, if they were true rivals at all, paled in comparison. In other words, recognition of the four canonical Gospels was actually not much of a choice. One helpful aspect of Hill’s volume is his emphasis on manuscript evidence and relevant archeological discoveries (e.g., chapter one). In canon studies, external historical evidence that has a bearing on the canon formation process is often scant and fragmentary. This reality makes the careful investigation of biblical manuscripts crucial and means that an interpreter’s presuppositions will play an important role in his or her analysis of the data. Hill is aware of this problem, and a vital part of his critique of those who downplay the existence of early forms of canonical texts rests squarely upon the assumptions that are made in the process (e.g., see Hill’s discussion of “minimialism,” 185-89). Further, Hill helpfully delineates between clear and tentative conclusions that can be drawn from the historical evidence. His case for an early establishment of the four Gospels is cumulative and moves from certain to plausible cases (e.g., 206). Hill also provides a historical context for various points of conflict that affect the interpretation of the manuscript evidence (e.g., “Do Christians read other books?” 75ff). In this way, Hill presents the “other side” of the argumentation used by the scholarly consensus. Also, because of the nature of the sources under investigation, sometimes Hill’s connections are thin and more difficult to follow (e.g., Papias’ nested quotations). However, as noted above, Hill recognizes this ambiguity and revises the tenor of his conclusions accordingly. In these areas, Hill might have strengthened his argument by interacting with the work of David Trobisch in The First Edition of the New Testament. Although Hill discusses many technical details and messy historical issues, he manages to keep his prose accessible and stimulating throughout. He also frequently engages the arguments of figures who have popularized the current secular paradigm of canon formation (e.g., Bart Ehrman, Elaine Pagels, Dan Brown). Rather than a conspiracy plot marked by malevolent skullduggery, Hill's narrative uncovers “the less sensational truth” (101) involving an early and natural recognition of a four-fold Gospel collection in the early Church. This apologetic aspect makes this book a helpful resource for evangelicals who are interested in careful and reasoned responses to these claims about the Bible and early Christianity. Hill also provides helpful introductions to a number of key issues in the canon debate and includes a brief glossary of unfamiliar terms. Thus, among the many competing accounts of Gospel selection, Hill’s volume would be a good choice. This review also appears in JETS 54.3 (September 2011): 631-34.